Access to ADA patient education brochures and videos is now available from our website. 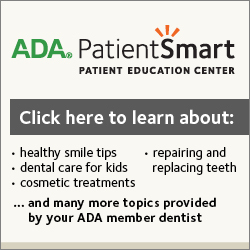 PatientSmart is a library of concise ADA patient education website content — all accessible right from a button on our home page. You can view videos – or read text and see images – drawn from the ADA’s brochures. We can even e-mail the content to you before or after an office visit. Dentists and patients alike know that the American Dental Association is the most up-to-date, reliable information source when it comes to dental health. Videos and easily printed web pages give you the right amount of detail as you follow your treatment plan.